Chicken breast halves are an excellent option when you need a quick meal. While boneless chicken breasts can be boring, it's all in the ingredients. 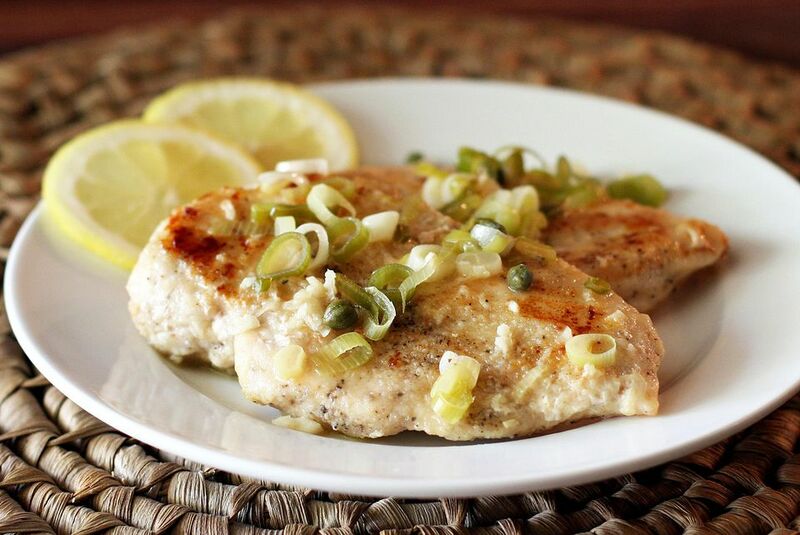 A tasty lemon and garlic sauce flavors these easy skillet chicken breasts, and the dish takes only 30 minutes to fix and cook. If the chicken breasts are large, slice them in half horizontally to make thin cutlets. If they are small, pound them lightly between sheets of plastic wrap to an even thickness. Sprinkle the chicken pieces with salt and pepper and dredge with flour. In a large skillet over medium heat, melt the butter with the olive oil. Sauté the chicken until browned, about 4 to 5 minutes on each side. Remove the chicken and add the garlic and green onions to the skillet. Sauté just until slightly wilted and aromatic, about 30 seconds. Add the chicken broth, wine, and lemon zest to the skillet. Simmer over medium-high heat for about 5 minutes to reduce and concentrate the flavors. Add the chicken back to the pan; cover and simmer for about 10 minutes, or until chicken is cooked through. Stir in lemon juice and capers and cook for 1 minute longer. Serve the chicken with hot cooked rice or pasta.